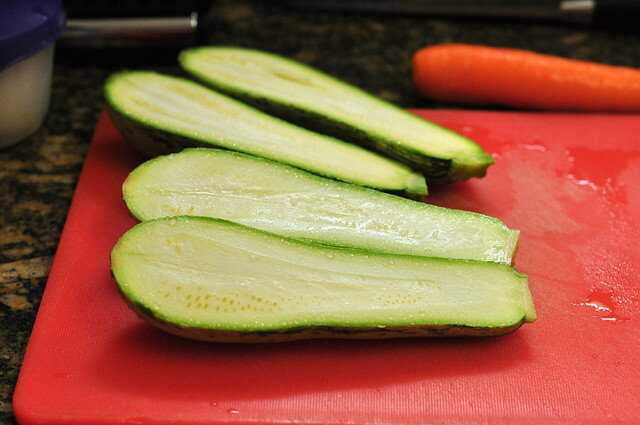 Then, using a spoon or melon baller, scoop out the flesh. Don't toss it, though! It goes into the filling later. 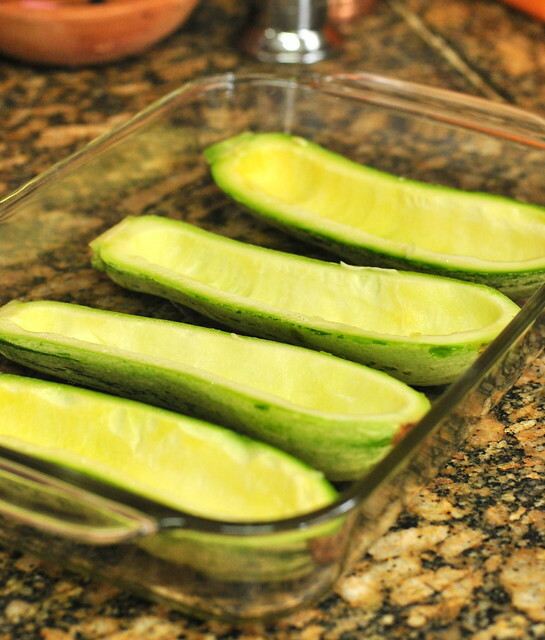 Place the squash in a lightly buttered for oiled baking dish. 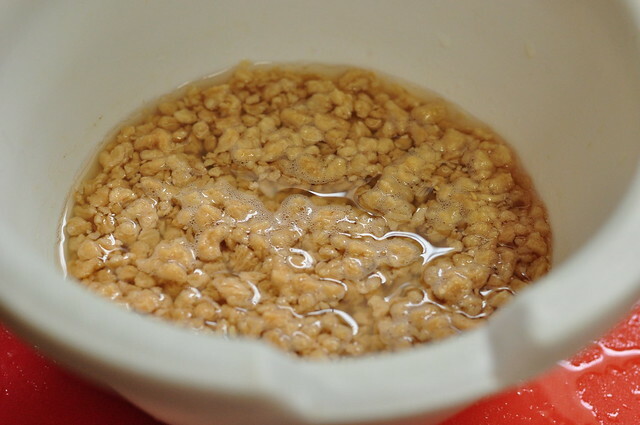 TSP is a soy product made to resemble meat in texture. 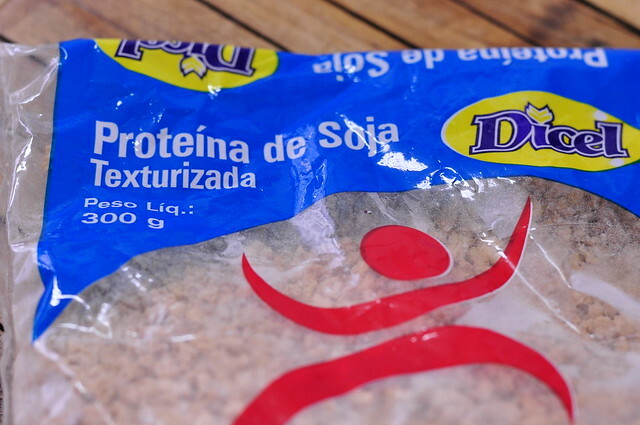 It's what soy burgers are made of, but also comes in a dried version that is easily reconstituted to a spongy protein source. It also acts like its sister product, tofu, in that it takes on the flavor of whatever it is cooked with, so it's very versatile. 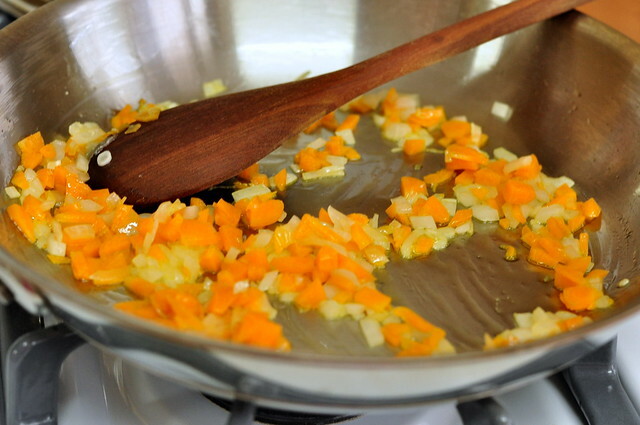 While the TSP soaks, cook the onion and carrot with olive oil until they begin to soften - about 10-15 minutes. Next, add the garlic, tomato, red pepper and drained TSP (Be sure to follow package directions) Let the veggies and soy cook on med-low for about 10 more minutes, stirring to blend flavors. 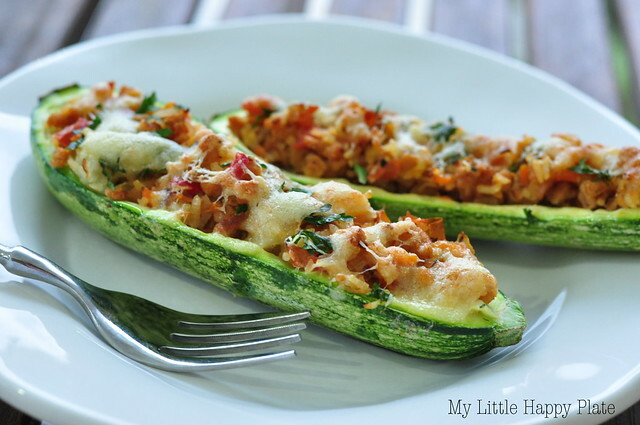 Spoon the mixture into the zucchini boats, and sprinkle the top with parsley for added color and flavor. Place in the oven for 15 minutes. Sprinkle tops with shredded cheese, then return to oven, and turn on broiler to melt the cheese - about 5-7 minutes. 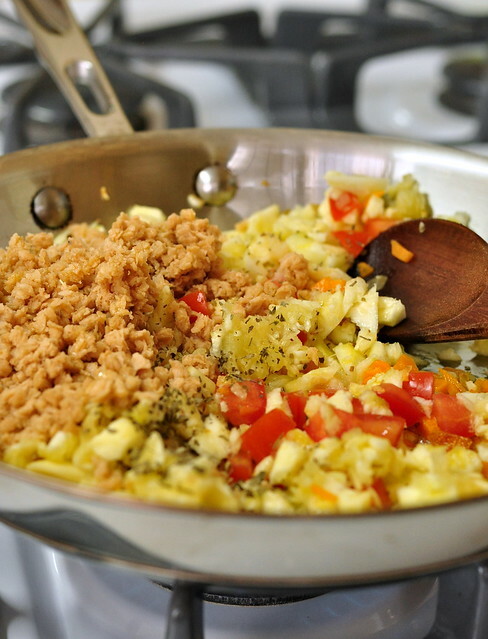 Using Carrots, Onions, Bell Pepper and Tomato (as well as the zucchinis themselves!) 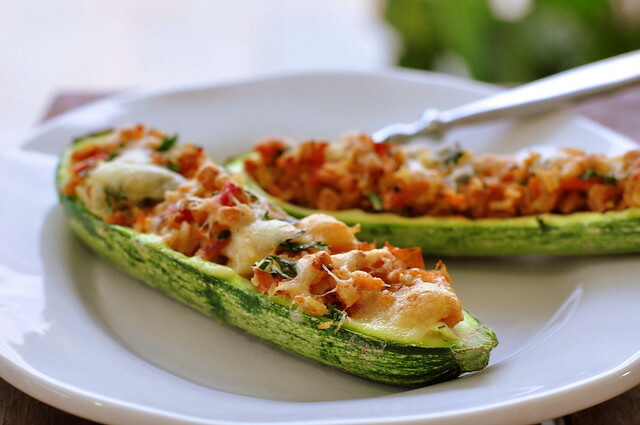 makes this recipe a good source of dietary fiber and nutrients such as Beta Carotene and Vitamin C.
The zucchini was a little too raw/crisp for me. If you're trying to eat at least a percentage of raw food, I think this version will suffice, but for my family, next time I'll either steam or parboil the zucchini before filling it. The recipe I went by called for the mixture to include sour cream. Sour cream doesn't exist in Brazil, so I skipped it, but the mixture definitely could've used some kind of binder and/or richener. Next time, I'll use either a soft cheese or plain yogurt to add a bit more richness. 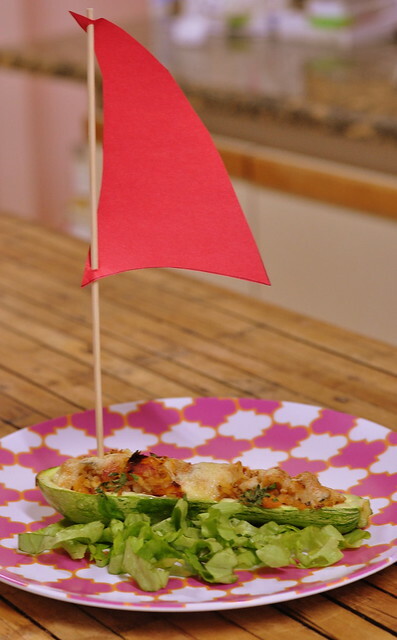 I made something similar not too long ago, except it was yellow squash boats. 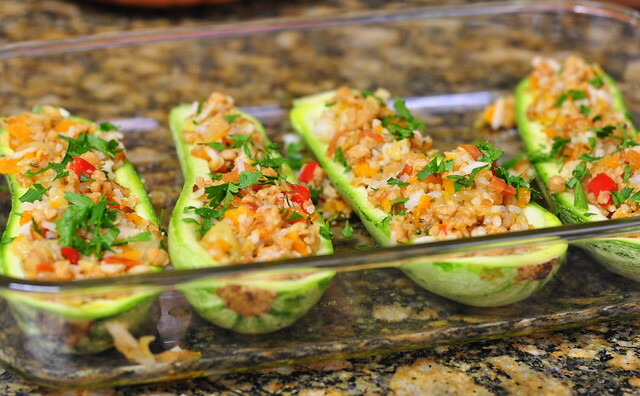 The filling was squash, garlic and onion mixed with goat cheese and bulgar wheat. Maybe if you add some grains, they'll fill you up more? Agreed on the rawness factor too--I baked the empty boats for a bit first to give them a headstart before adding the fillings. Love the sail! You're one of the cool moms. I can tell.